The weather in Wales has been quite Spring like lately, even though its still a bit chilly outside haha. I have been using these two cleansers since the very start of the year, but wanted to wait until the Spring to do my review, as they are very refreshing and perfect for Spring/Summer use. I'm sure you all know that I work at an Elemis Spa and have done so for just over a month now. I'm really enjoying it and I'm making some really good friends, which is really helping me boost my self confidence. The Fresh Skin range by Elemis is targeted for late teens to late twenties and is suitable for most skin types. It's also my 21st birthday tomorrow and i'm SOOO excited haha... I'm literally like a child. I might be doing a birthday related post at some point, but not sure when that will come as I'm super busy with work and uni deadlines at the moment. Anyway, I hope you enjoy this review and I would love to know what you think! 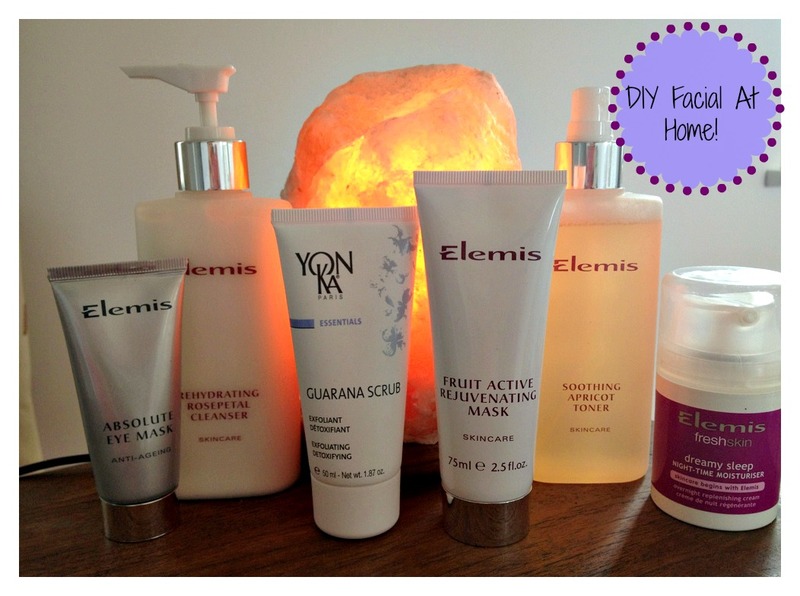 A lot of people get scared off by gel foaming cleansers, as they can dry the skin out. 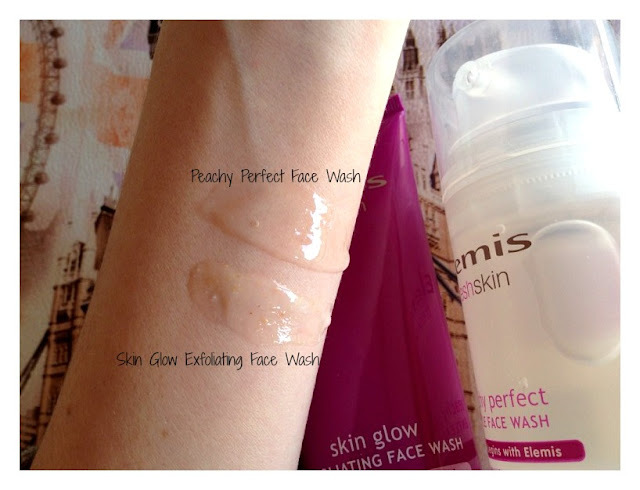 However, I promise that this face wash is nothing like that at all. It's the perfect balancing face wash that doesn't strip your natural oils, but instead leaves your skin soft and glowing. The main ingredients are Chicory, Elder flower and Lemon which help to hydrate, condition and awaken the skin. This cleanser is so versatile and really can be used for all skin types and at £12.00 I think its a great buy, as Elemis are a fantastic Spa brand that do not test on animal or use any nasties. This is a fantastic staple exfoliating wash that could be used for everyday use, but personally I use this exfoliator 2-3 times a week to help refresh my complexion. It uses jojoba beads which are amazing due to their texture being very soft, which means that they don't scratch the skin leaving micro lacerations. The Elemis Skin Glow also uses Cherry powder which is great for polishing the skin, as well as Mandarin and Aniseed which help soften and brighten the skin. This product is also £12.00 which I think is really affordable for a Spa brand. I would love to know what you think lovelies.. will you be trying out these cleansers ? I'm sorry for not being as active recently, but I'm really going through a stressful period. Nothing major is wrong, but everything is happening at once and its leaving me really tired and un-motivated. However, I'm still here and I'm trying my very best keep up to date with my blogging. I actually wrote up this review about two weeks ago, but then my opinion kept changing on this product so I wanted to wait until I knew exactly how I felt about it before fully reviewing it. You will probably know that I'm a huge YSL fan and I always sway between Chanel, YSL and Benefit when it comes to makeup. I'm lucky to have parents who jet off all the time( lucky buggers), which means that I do get some rather nice duty free perks now and then (not complaining) haha. My dad especially loves the YSL packaging, so I was really pleased when him and my mum brought me back some goodies including the YSL "SHOCKING" Mascara. I am actually really excited to do this post now and think it might be really helpful to someone who wants to buy it or has recently got it like me. I hope you enjoy this review lovelies and if you ever need to contact me don't hesitate to get in touch via my Social Media buttons just under my blog image. My first impressions weren't quite as good as I had expected with this mascara. I found it hard to work with, but I did like something about it ... I just couldn't work out what was wrong. The first two weeks I found it very wet and quite clumpy, but once I had combed it out with another wand I was happy with the results. I liked the formula a lot as it didn't smudge at all and stayed on my lashes all day, I was also really impressed with the volume it gave my lashes. However, I just found it hard work and I couldn't seem to get it right without the help of another mascara to even the lashes out. 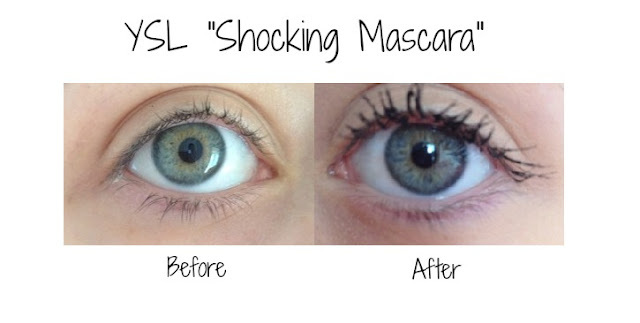 This mascara would be absolutely amazing if it had a different wand. If this mascara had the same wand as Benefit's "They're Real" or even Chanel's "Inimitable" wand I honestly believe this mascara would be like HG status. I find the brush really collects so much of the product and that means that the application isn't even and quite hard to control. However, I have noticed that now I have had the mascara for a while it is becoming easier to use. My last four applications have been without the aid of another brush, which is probably because the mascara isn't as wet as it was within the first two weeks of owning it. I have been wearing it every single day since I have had it, and I must admit it's growing on me. A gorgeous mascara with a fantastic formula, which sadly lacks a brush which can help it reach its full potential on the lashes. However, there are ways around the brush issue and I honestly think that this is a great mascara for adding a real oomph to your lashes. The packaging is stunning as you would expect from YSL and the "Shocking" writing on the Gold packaging gives it a bit of an interesting edge. 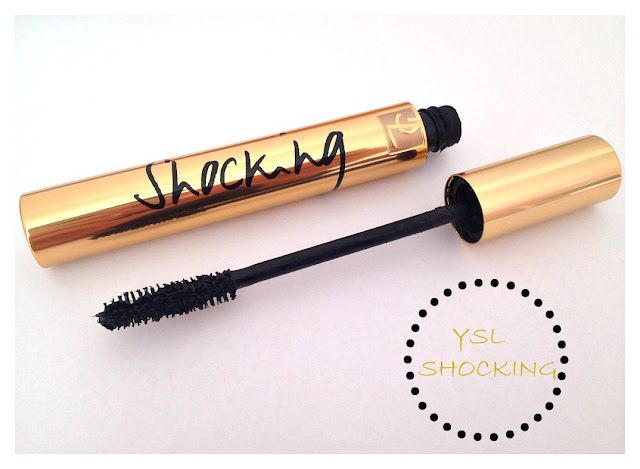 It is expensive at around £22.00, but It does deliver the intensity that YSL describe on its product description. If they release this mascara with a new brush I will be stocking up on this beauty, but until then I don't think I would repurchase. I have seen some rave reviews and some not so impressed reviews, and I think I stand somewhere in the middle, so I would love to hear your thoughts on this one beauties ? I have been meaning to do this post for the longest time and I finally feel ready to post it. 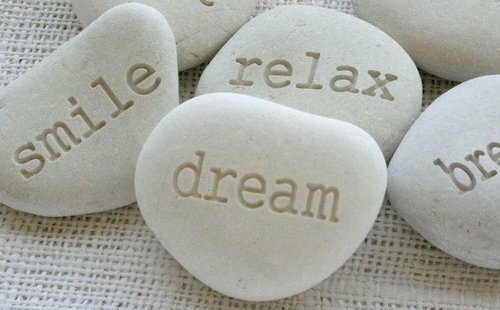 Relaxing is something that a lot of us dream about, but never actually get around to doing half the time. Everyone has their own reasons, but the stresses of life do definitely take over a good bit of traditional "me time". You don't have to spend all the money in the world to pamper yourself and the best part about this post is that you can use whatever products you like, the products I use are part of my personal regime and that is why I'm using them as an example of how I relax. I am going to be doing a series of three posts and the next two posts to follow will be "Total Relax Hair Care Edition" and the "Total Relax Body Care Edition" I really hope you enjoy this post and that it inspires you to take a bit of time out, even if its just for 10 minutes of the day. I find that my skincare and make-up routines are the best ways to help me relax, but I have also included a little list of other things that might help. Start your journey of relaxation by cleansing your face with your favourite cleanser, ideally one that is purifying but non stripping of the natural oils of your skin. I use the Elemis Rosepetal Cleansing Milk which is very nourishing and perfect for a treat. Follow by using an exfoliating skin scrub to reduce the build up of dead skin, this step will also add natural radiance to your complexion. I use the Yon-Ka Gurana scrub which contains two exfoliants (Gurana and Organic Brown Rice), which also helps to detoxify the skin. Then choose a mask which is suitable for your skin. Clay masks are usually better for oily/combination types and a creamy or gel textured mask for skin that needs more hydration and care. 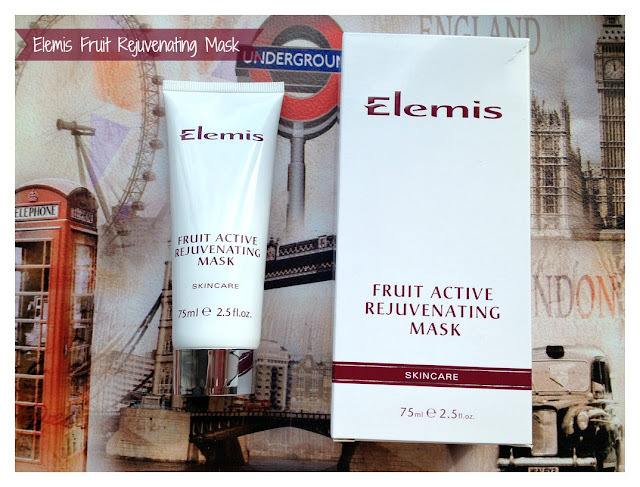 I use the Elemis Fruit Rejuvenating mask, which smells beautiful and is a real pick me up. 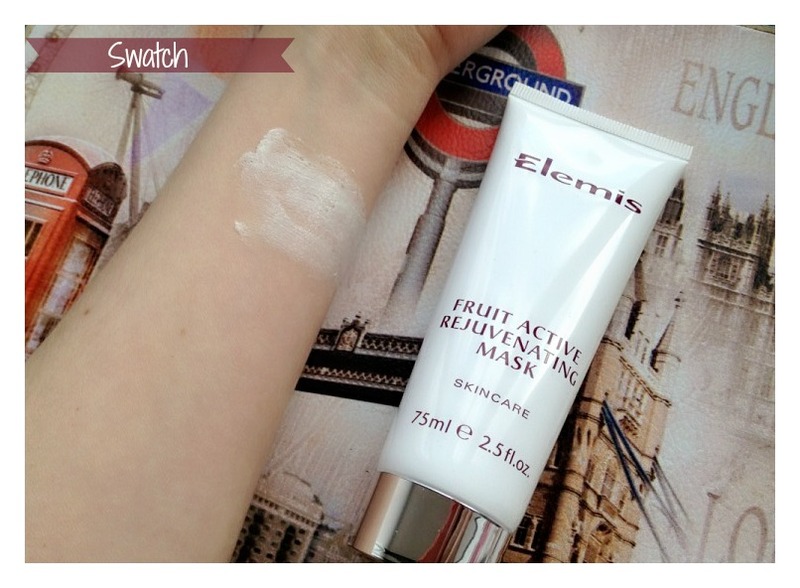 It is fabulous for normal/combo/dry skin types and helps to restore a glowing complexion. After indulging with a mask of your choice use a toner if you have one to help restore your skins natural PH levels. I use the Elemis Soothing Apricot Toner which has become one of my all time favourite skincare products. It smells beautiful and is a fantastic soothing toner, which also gives the skin a natural healthy glow. Moisturizing your skin is extremely important and even oily skin types need moisture. Use this stage to really complete the total relax facial. Use circular movements when applying the moisturiser, by doing this you will help to remove toxins, as well as providing the tissues with oxygen. I use the Elemis Fresh Skin Dreamy Sleep Moisturiser, which helps to replenish the skin overnight. Finally don't forget to treat your eyes and lips as well, I use the Elemis absolute eye mask which is a mask specifically for the eye area, It also has loads of lovely ingredients including cornflower. Just 10 minutes can help to reduce stress, so don't let stress take over your life for the sake of giving up 10 minutes of your day. I would love to know your thoughts about this post and feel free to share your own relaxation tips, as well as the brands you like to use to pamper yourself. I was thinking to myself how many lip product related posts that I do on my blog haha... but hey every girl loves a lipstick right?. I would definitely say that lip products are my weakness, so I thought I would bring you a review of a lipstick that is definitely going to be a spring/summer must have. I am slowly growing a collection of MAC products and I must admit I am smitten with their Cremesheen lipsticks. I was super lucky to be the winner of Makeup Pixie's fantastic giveaway of a MAC lipstick of my choice. I knew straight away that I wanted it to be a coral/peach shade, as they are my favourites for Spring and Summer. I also thought I would get a bit creative today and add a fun background to my pictures, which I hope you like. 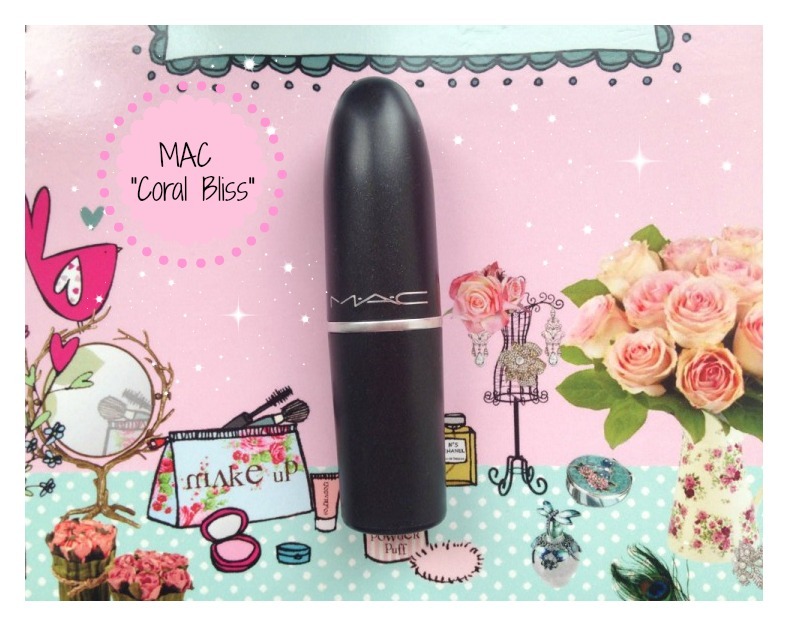 Coral Bliss is a soft Pink Coral which I think looks absolutely stunning on. I did my research and found that it looked lovely on both lighter and darker pigmented lips, which is something that I find can be quite hard to achieve with most lipsticks. My lips are quite dark and I found that it still showed up as the Colour in the tube, which made me fall in love with this lipstick even more. 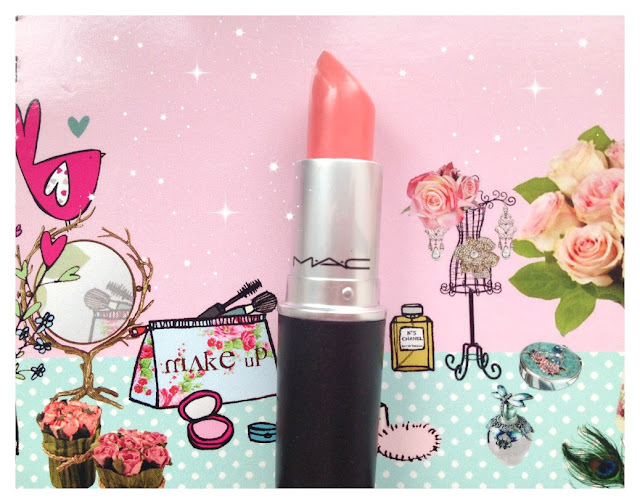 It is a slightly less Pinker version of MACS lusted after Cut a Caper shade, which sold out very quickly. 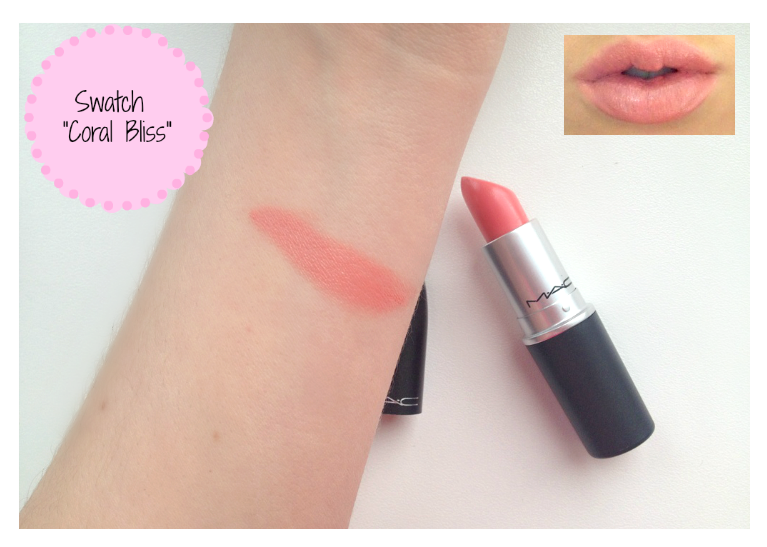 Coral Bliss is also really quite pigmented and I find that its also comfortable and long lasting on the lips. I don't think you can go wrong with MACS selection and finishes when it comes to lipsticks (and most things actually) and they are also cheaper than YSL and Chanel lipsticks. If you are looking for a Coral lipstick but prefer it more on the Pink side then this would definitely be a good option. The formula is pretty comfortable, but at times ever so slightly drying on the lips. However, for £14.00 I am really impressed by the shade variety and pigmentation of the majority of MAC lipsticks I have tried so far. I would love to know what you think about this shade... is it something you would go for ? - Also if you have any other MAC recommendations for me I would love you to leave them in the comments section below :). 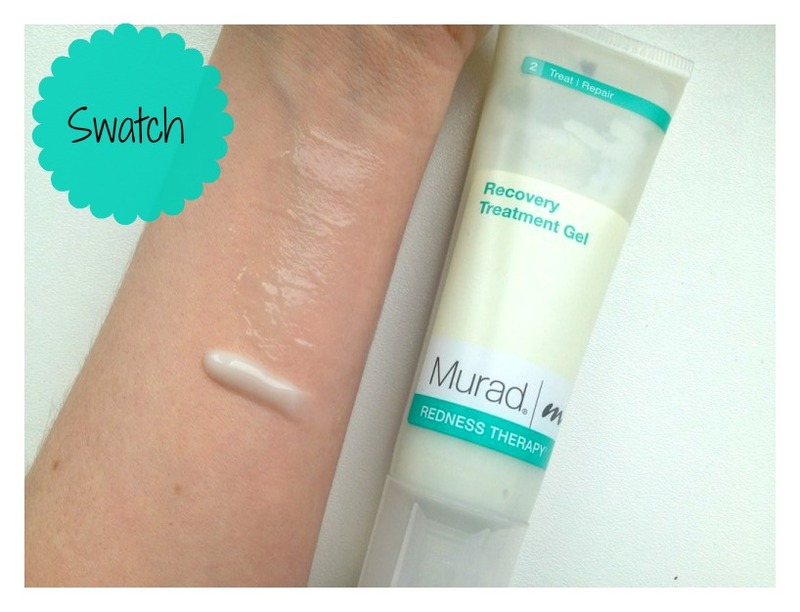 I have been trying out the Murad Redness Therapy Recovery Treatment Gel for around a month now and thought it was about time I shared my review with you all. I do suffer with mild redness on my face and the main area's are my cheeks and forehead. I decided to try this specific product as I thought that a treatment gel would be good for use especially when my redness flared up a little more than usual. This is my first time using Murad, so I made sure I did my research to learn more about the brand. Dr Murad is classed as being one of the best Dermatologists in America, who graduated from UCLA as a board certified dermatologist. It was actually really interesting researching the Murad brand and I have found some great products that I would love to try in the future. I hope you all enjoy my review and if you have any further questions, please don't hesitate to leave a comment below, or to contact me via my social media buttons. Firstly, I really like the texture of the treatment gel and I found it to always be very cooling and calming on my skin after application. A little goes a very long way and the gel smoothes out and leaves the skin feeling perfected. I would honestly say that this product has helped to calm down my redness, but it hasn't removed it (which i wasn't really expecting it to do). The gel is ideal for sensitive skin, as it has some lovely soothing ingredients which help to keep the skin from getting tight or inflamed. I was using this product all over my face two times a day, but didn't feel like it was fitting in with my skincare regime. So I decided to start using it only on area's that needed treating, and since changing the way I use it I have found that it has fitted in with my skincare regime a lot better. I also won't use it unless my redness is causing me an issue, which has worked a lot better for me. The only other negative in my opinion is the price, as I find that £50.00 is quite expensive for 50ml. Overall, I do feel that this product does actually do quite a lot of what it claims in its product description. It does smooth and soothe the skin, as well as helping to reduce redness. However, from my use I definitely prefer it to treat certain area's opposed to using it as an all over treatment. 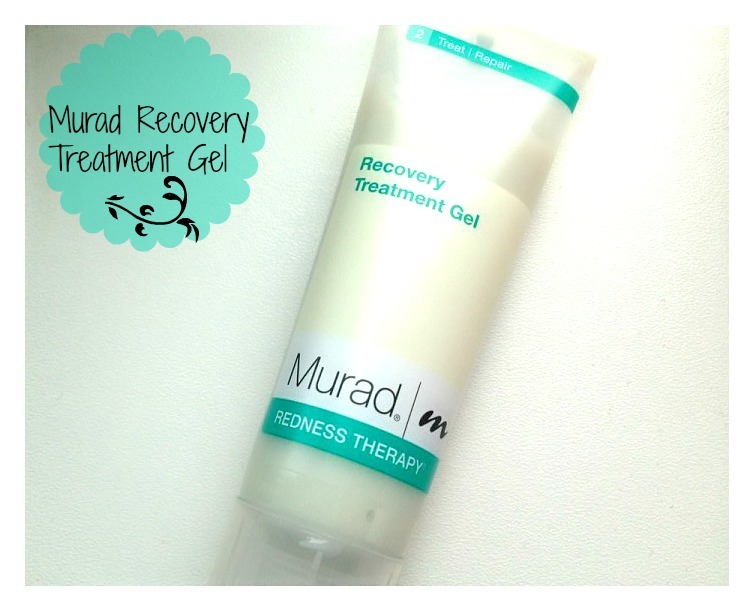 I do feel that this product is more on the expensive side being just under £50.00, and I also feel that if you were looking for a comprehensive anti regime, then you would be better purchasing the Murad Therapy Regime, as you save money that way. Finally, I always recommend doing vigorous research when it comes to skincare, as my skin will differ to yours. If your not sure on a product always contact the company first, and try and find as many reviews as you can. I would love to know what you think, would you be interested in trying this product ? *This product was sent to my for review and my opinions will always remain 100% honest. 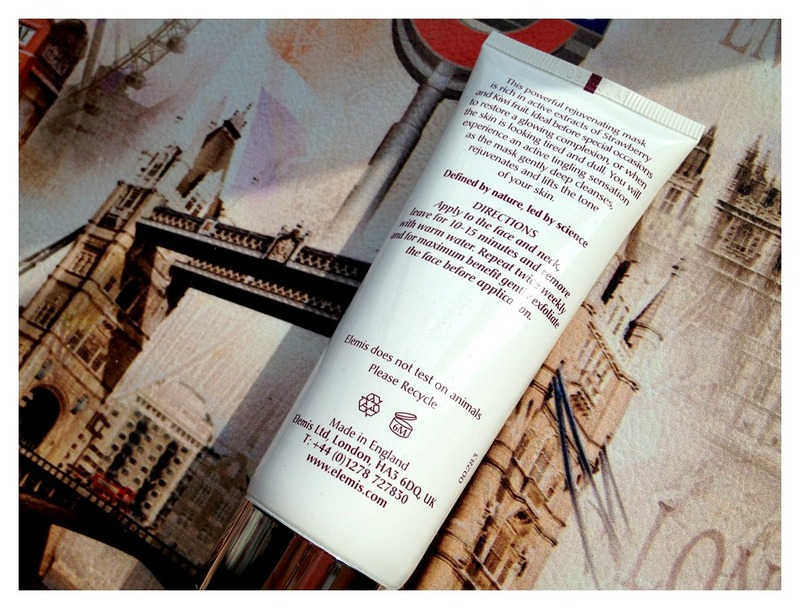 Today I have a bit of skin care loving for you all and I wanted to share a product that I have really been loving. The Elemis Fruit Rejuvenating Mask* Is honestly such an amazing feel good product, and I can't even describe how delicious the smell is. I have actually just taken pictures of it on my arm and I literally can't stop smelling that area haha!, its such a gorgeous fruity smell. 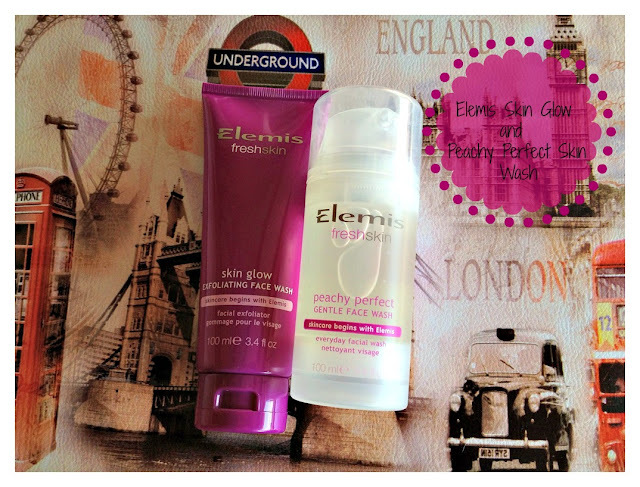 I have recently been trying quite a few skincare products, but I have to admit in all honesty I always go back to my Elemis products. I'm a huge fan of not just their spa range, but also their fresh skin and clear skin ranges that are aimed towards late teens to twenties. A face mask is such a treat and I couldn't be without one these days, as they are such a great way to take away the stresses of everyday life. I hope you enjoy my review and if you need any advice or would just like to have a chat please don't hesitate to contact me via my social media icons or in the comments section below. A powerful rejuvenating mask which is rich in active extracts of strawberry and kiwi fruit. Ideal before special occasions, or to restore a healthy glowing complexion. Firstly, I can't help but mention the gorgeous smell which isn't overpowering at all. The scent is lightly fruity, which is an instant pick me up even before you have put the mask on haha. The mask texture is in between a cream and a clay, as it isn't as hard as a clay, but not as light as a daily moisturising cream. When I apply the mask I don't really experience any real tightness and within about 15 minutes the mask has mostly absorbed, leaving my skin feeling really rejuvenated. I then remove the mask with warm water and my face feels really soft and I can definitely see more of a glow to my skin after use. It almost reminds be of a beauty balm, as it leaves my skin really supple and settled, which is lovely for after a stressful day or in preparation for a night out. I have normal/combination skin, but I don't think that this mask would be suitable for oily skin types as this product is aimed towards normal/dry skin and it does contain a lot of moisturising ingredients. If you have Oily skin then you might prefer the Lavender mask, as the lavender mask is designed to ease congested complexions. The price is just below £30.00 which is quite expensive, but it definitely could be the perfect birthday treat! I'm sure you have heard all about Benefit's latest craze "Fake Up" and I was absolutely gutted when I couldn't attend the Swansea event *boo*. However, I finally managed to get myself to a counter the other day and picked up the shade light. I thought I would make this post a little more interesting for those you have had enough of seeing Fake Up haha, so I have included some of my other Benefit concealers. I am sadly missing Boi-ing which I also have in my collection, but I have a feeling I could have left that at my boyfriends house. I have never really strayed away from Benefit concealers, as they are just total HG status for me and Fake Up is definitely a firm favourite now as well. What I like about Fake Up ? I must admit I wasn't 100% sold on the thought of a moisturising concealer as I thought it might be a little greasy... but oh my was I wrong!! - This concealer has a beautiful silky feel when applied under the eye area and it doesn't leave the slightest bit of greasy residue, but instead covers up any darkness and keeps the under eye area nice and healthy. I was looking for another concealer as my beloved Erase Paste is too messy for quick touch ups in work, and requires a bit more mirror time as I like to call it haha. So when I heard about this multi tasking ans super convenient concealer, I was really happy to give it a whirl. After using it for just under a week I'm really in love with it, and also I find it super long lasting. Also.. 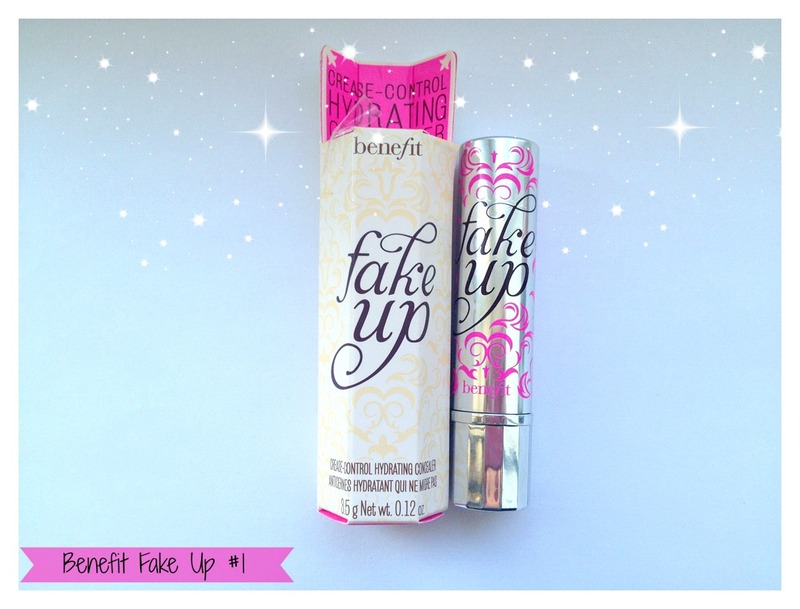 I couldn't forget to mention the packaging which is super fun just like Benefit. I do love the classic packaging styles of YSL and Chanel, but honestly Benefit injects so much fun into my make-up collection and its a brand I really do see myself using for a very long time to come. What I don't like about Fake Up ? I can't find anything I really dislike about Fake Up or any of the Benefit concealers to be honest, but the only thing is the shade selection they offer. One part of me thinks three shades is super simple, but then another part of me thinks that there must be a ton of people who are in between shades. Erase Paste has been consistently part of my make-up bag for the past three years and I'm on my third pot now. I honestly don't know where I would be without this concealer as it has helped me to concealer my pesky dark circles for so long now. The Melon undertones in the Erase Paste shades really do help to Colour correct any darkness, which is why I love it so much. However Erase Paste is quite thick and can get a little messy, so if you are looking for an on the go concealer I would recommend either Fake Up, Boi-ing or Perk Up. Boi-ing Firstly, sorry about the lack of image but I think I left this one at my boyfriends house on the weekend. Anyway, Boi-ing is a great concealer for covering up blemishes and is classed as being industrial strength haha. 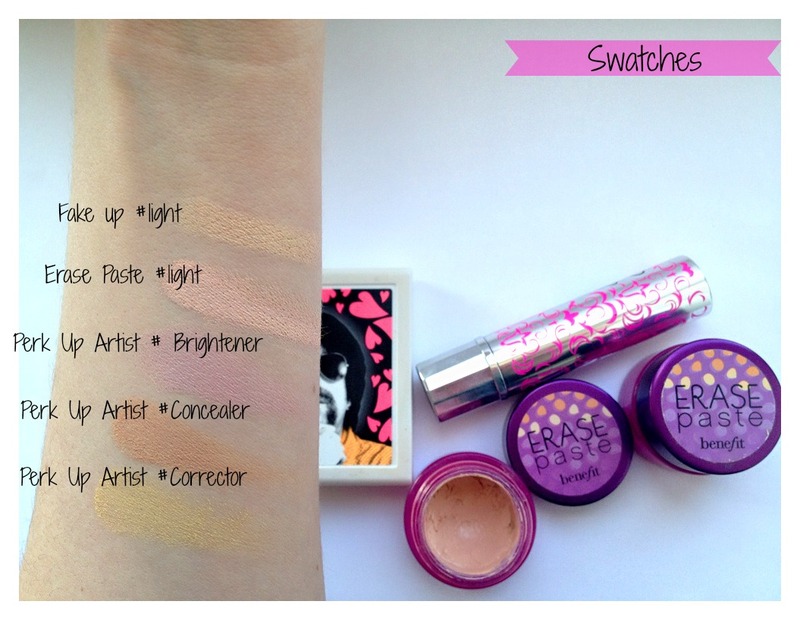 Personally, I wouldn't use any of the other Benefit concealers for blemishes, as they are quite highlighting and might actually bring focus to the problem area. I do like Boi-ing, but I must admit I do love a bit of Collection 2000's lasting perfection when I get spots. The Perk Up Artist is a great little palette which includes a corrector, concealer and brightener. I feel that this would be perfect if you are planning to travel, or just want a complete eye kit under one roof instead of having three separate products. The only thing I would say is that the products are quite sheer, so if you need more coverage then this might not be for you. The concealer in this kit is also quite versatile and very easy to blend out. I think you can probably tell I'm a little obsessed with Benefit concealer's haha, but genuinely I would recommend them all. 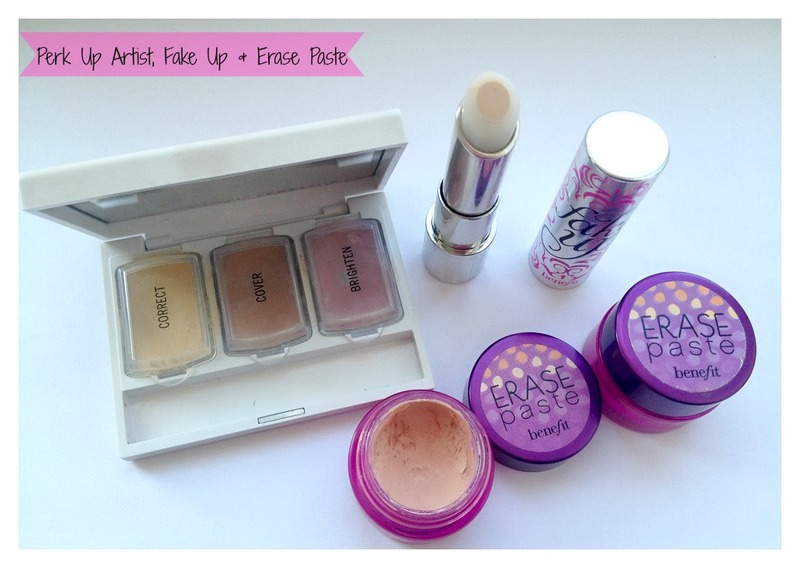 My favourites are definitely Erase Paste and Fake Up, as they are both amazing in their own ways for under eye use. However, if you are looking for a kit with more than one product then The Perk Up Artist would be a great option and finally Boi-ing is definitely best for concealing blemishes. I thought I would give each concealer a little award in what I think its best for, so hopefully this might help you out if your trying to choose. If you need any other help then please just comment below or use my social media icons to contact me.